TOTAL FLANKER...a rugby blog: North Shields or South Shields? 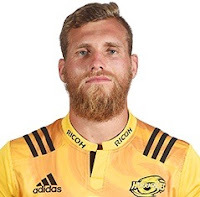 In a possible tug of war between England and the NZRU over the services of Hurricanes backrower Brad Shields this summer, there is only one likely winner. Shields is eligible for England via parentage and has signed to play for Wasps next season, enough for the RFU to give Eddie Jones the go ahead to select him for England's tour of South Africa in June. Jones wants to select the player and Shields, given that he appears to have requested to be released for the tour, wants to go. As World Rugby regulations require the release of selected players during any international window it therefore seems that, despite their protestations to the contrary, the NZRU have little choice but to comply. My only question is why the rush? Shields arrives in the Premiership in September. Why not see how he gets on and then (call me old fashioned) select him if he demonstrates that he's good enough?